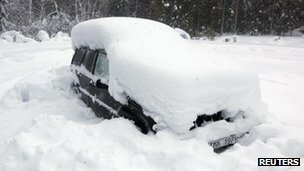 Odd news story tonight about the Swedish man who was dug out alive after being trapped under snow in his car for two months with no food or other supplies. He was found not far from one of Sweden's larger cities by snowmobilers who thought they had come across a car wreck until they dug their way to a window and saw movement inside. The man, who was laying in the back seat in a sleeping bag, said he had been in the car since December 19. He is now in hospital where doctors l said humans would normally be able to survive for about four weeks without food. Besides eating snow, the man probably survived by going into a hibernating state. Where were the man's family? friends? lover? Did anyone notice that on Dec 19th he left work and headed home but never came? Was there a Christmas present under a tree with his name on that was never collected? I hope someone cared enough to notice he was gone. Speaking of gone - Tony left me today. He is in Auckland for the start of his Massey University course and will be there till Wed. Tonight he is with Una and Bernie and tomorrow he goes to Maria and Tim. I care. I notice he's not here. So does Lily. We would be lookign before 2 months is up.